This was our second time staying with our two young teenagers in the Merrion Mews house. 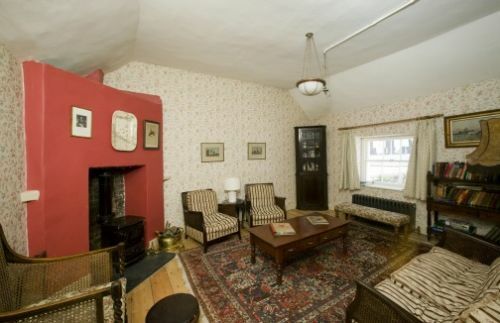 The house is ideally located for a city break for taking in the cultural and landmark highlights of Dublin. The house itself is incredibly peaceful, quiet and makes you feel very safely nestled in a little oasis of calm in the middle of everything. The house is incredibly comfortable, a real home away from home, beds and bathrooms are of a very high standard. The kitchen is extremely well equipped , everything works and is uncomplicated. Great for a family with two kids who all need their own space and lovely to have a break from screens and telly. Communication and timings with Leah were excellent, couldn't have been met by a nicer girl. Thank you for such a lovely review and for supporting Irish Landmark Trust by staying in one of the properties in our care. We are delighted to hear you had such a lovely return visit at Merrion Mews, and that everyone enjoyed their time there. We thoroughly enjoyed our stay at Merrion Mews. The location is fabulous and was within walking distance to everything we planned to see in Dublin. As with any older property, there were some quirks (lower lighting in the kitchen, strongest wi-fi in the back bedroom, and with 6 adults we had to time the hot water usage) but all those were somewhat to be expected and the charm and location more than made up for it! Thank you for much for taking the time to let Irish Landmark Trust know how much you enjoyed your stay at Merrion Mews in the heart of Dublin city. It is wonderful you had such a lovely time and that you found the location of this self-catering property perfect for your trip to Dublin. We do hope to welcome you to another Irish Landmark Trust property in the future. Thank you for staying with Irish Landmark Trust. It is lovely to hear you had a lovely time at Merrion Mews. We really loved out stay here. Dublin on your door step. Secure parking for car . Toasty warm and beautifully decorated. It was like staying in a very comfortable country cottage in the middle of town. Delighted to hear that you had a nice stay during your time at Merrion Mews in Dublin city centre. It is such a unique property and so quiet considering the location. We hope to welcome you back again in the future. Dublin city centre but a world away! What a fantastic city break we have had. Merrion Mews is less then 10 minutes walk from the hustle and bustle of Grafton Street but it is a perfect quiet and calm retreat for coming home to after a day exploring the city. It is so hard to believe that this incredible and historical property is right in the heart of it all. The property itself was spotless and you can see very well taken care of by the charming and attentive House Manager. Plenty of room for the 5 of us to relax and lounge around in the evening time, playing board games and cards, drinking endless cups of tea and catching up without the distractions of tv or facebook, etc. The bathtub is huge and really deep and the hot water supply absolutely perfect for topping up and letting the day's adventures just float away. There is plenty of plates, cups, dishes, glasses, cooking ware, etc but do remember this is a self-catering property so handy to have an extra couple of tea towels, kitchen paper, food, etc depending on how long you are staying. The stables downstairs were not in action during our stay unfortunately. The cobbles in the outside courtyard are so picturesque and wonderful restoration by Irish Landmark is really such an achievement and the importance of their work is paramount. I for one will continue to try and stay in their properties to support their work whenever I can, and I think the rest of the group felt exactly the same. Thank you so much for taking the time to let Irish Landmark Trust know how your recent stay at Merrion Mews went. It is wonderful to see that you had such a good time and that you had a great Irish Landmark experience. We just love to hear about guests really embracing the joy of no electronic distractions of social media, television, etc and just relax and reconnected with friends and family over a good game of scrabble. Lovely property and brilliantly located. Enjoyed a lovely weekend in Dublin staying in this beautiful, historic property. Would recommend to anyone visiting the city. Lovely to hear you enjoyed Merrion Mews and found it's location great for a city getaway. Thank you so very much for the recommendation. Also good central location. Only criticism- it was rather hot even after turning thermostat down. Thank you for staying at Merrion Mews, an Irish Landmark Trust property. We are delighted to hear that you and your family had a wonderful stay at Merrion Mews and enjoyed the city center location. Have stayed here several times before. Old world feel that gives your stay an extra sense of adventure. Excellent location to explore Dublin. Lovely to have you back to stay again at Merrion Mews. Thank you for your continued support. Beds were not that comfortable, but everything else was good. Arron was very helpful and responsive. Nice and convenient. Lovely character and plenty of space. Had some problem with water temperature and pressure. All was eventually resolved. Would stay again. Thank you for your review of your stay at Merrion Mews. We are glad to hear that you found the location was good for your requirements of your trip. Merrion Mews was an amazing place to stay. Merrion Mews was interesting, comfortable and a fabulous location. It was definitely a special place to stay and wehighly recommend it. Thank you for your review. We do love to know that our guests truly enjoy their stay. Merrion Mews is such a fabulous property in such a perfect location in the heart of Dublin city. We hope you can stay with us again soon. See an earlier e-mail sent directly to Mary & Irene. It reflects the complete satisfaction my group experienced while staying a Merrion Mews. P.S. Somehow/somewhere I had the sense that the Mews was still - from time-to-time - continued to serve as an active stable for constables guarding the neighboring parks. It appears as though I was totally mistaken...or was I? Thank you for letting us know by email and your review here, that you had a pleasant stay at Merrion Mews. It was wonderful to receive your email and Irish Landmark Trust are delighted that you had such a lovely stay. Yes, the stables below the accommodation upstairs are still in use by the Garda Mounted Unit from time to time. 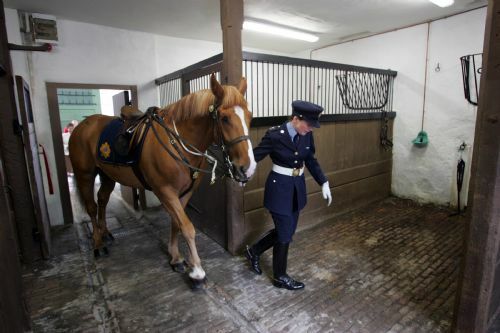 Guests may not see them during their stay but sometimes they do visit the stables to rest the horses during events in Dublin. I've read a lot about Dublin past and present. On my wall hangs an illuminated verse of a poem by Louis MacNiece entitled "Dublin." All this to say that I had preconceived notions about what a Landmark property in the heart of Georgian Dublin should look like. Those mental images came to life as we entered Merrion Mews for the first time. The five other members of my family group, including my 17-year-old granddaughter, did not have the same preconceived expectations, yet they, too, found themselves charmed by the authenticity and grace of the Mews's decor. The property is accessed through the courtyard of what was once a carriage house and now serves as a resting place for the city's mounted Garda and their steeds (of which we were not fortunate enough to catch a glimpse). Through the stables and up the steps we found a perfect little nest that maintained all the charms of a turn-of-the century Dublin home while combining the comforts of the 21st century. I luxuriated in an old-fashioned white enamel claw-foot tub, while the rest of my family took their turn at a huge modern shower, both whistle clean. Once refreshed, it was hard to tear ourselves away from the Mews to explore our surroundings. But once we did, we found ourselves looking down the alley directly at Leinster House with the French Embassy as our neighbor. It was only a short walk to the sites we had selected to investigate: Trinity College, the National Museum of Archaeology, the Jeanie Johnston, Christ Church, and, of course, shopping at Carrolls for the 17-year-old. Pearce Station for the DART was just a short walk, so one evening we explored Dun Laoghaire. Within three short days, we began to call Merrion Mews "home," as in "Let's go home and have a cup of tea." I could easily have lived there the rest of my life. What a lovely and wonderful review for Merrion Mews, from a guest who appears to have matched the property as much as the property may have matched them! It is just so great to see that you thoroughly enjoyed the Irish Landmark experience and that it may have perhaps won over the rest of your group, even the 17 year old? Thank you for supporting Irish Landmark Trust. As a guest you are helping us in our mission to save, share, and sustain Ireland’s built heritage. It might not feel like your holiday is anything but a relaxing indulgence, but when you stay in an Irish Landmark property, you’re part of a community that’s helping to keep heritage alive. Each of our properties has been carefully restored, but it is the guest – and all those who visit – who add the essential heartbeat that gives new life to these properties. We hope you’ll agree that a stay in an Irish Landmark property is memorable, comfortable, and elegant without any manufactured lifestyle gimmicks. Irish Landmark offers its guest more than just a place to stay. At our properties you have an opportunity to experience the best of a former way of life: beautiful architecture, fascinating history and a peaceful relaxed ambience, where you decide the pace of your holiday. A great place to stay in the heart of Dublin! 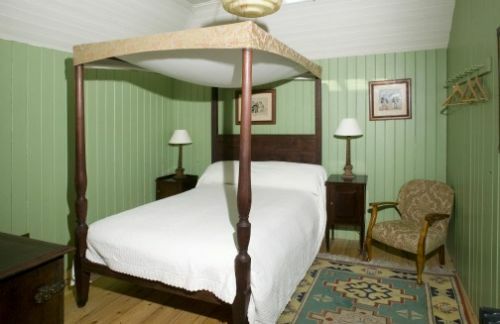 The property was beautifully restored and although small, it was very comfortable for six adults. It was perfectly situated in the middle of Dublin, an easy walk or bus ride to all of Dublin's attractions, with restaurants, pubs, and grocery stores in the same block. I would definitely stay here again. We had a lovely stay in a unique property. The accommodation is traditional whilst at the same time having all necessary modern conveniences. Thank you! Great to hear you enjoyed your stay in Merrion Mews and that you really appreciated the period features withing the property. Thank you for supporting Irish Landmark Trust and we hope to welcome you back in the future. We had a great stay. The location is excellent for those with only a few days to enjoy the museums and galleries of Dublin. We could walk easily to all of the sights on our list. Also within a few blocks of excellent restaurants and wine bars. Full marks to the trust for injecting charm and comfort into a building that is a true gem hidden in plain sight. Delighted that you had a lovely and enjoyable stay at Merrion mews, right in the heart of Dublin city. It's location to all that Dublin has to offer is perfect for those who wish to stay in the city centre but want peace and quiet in the evening when they return home to relax and unwind after a day exploring. We very much enjoyed to stay in the very comfy Merrion Mews. Gave a flavour of traditional Dublin, lovely hosts, all very well set up. Thank you for supporting Irish Landmark Trust and the work we try to do to save, share and sustain Ireland's built heritage. It is wonderful to hear that you had such a lovely time in Dublin. Energetic walk or short ride to whisky museum and Guiness brewery see them all! Merrion Mews is a perfect location for guests wishing to visit all the best the Dublin City has to offer. Delighted to hear you had a chance to enjoy the wonderful Capital city of Republic of Ireland. Thank you for letting us future guests know you had a wonderful stay. Lovely stay at Merrion Mews a was a totally different experience in the best Location with car parking. Thank you for the great review. Merrion Mews is such a central location in the heart of Dublin city and to have parking included is indeed a big bonus! We're delighted you enjoyed your experience and hopefully you can visit another of our many unique properties in the near future. Our host Arron was very helpful and contacted us immediately when we needed help with something. The Mews is located in the heart of Dublin - you can walk practically everywhere. Furnished with lovely period furniture, but the kitchen equipment is modern. Very quiet. Would heartily recommend it. Congratulations to the Irish Landmark Trust on their work on this property! Thank you for the great review and recommendation! Merrion Mews is such a beautiful, quiet oasis in the heart Dublin city and we're delighted you enjoyed it. You're always in good hands with Arron, he's a great House Manager. We hope to welcome you to an Irish Landmark Trust property again soon. Amazingly peaceful city centre stay. Merrion Mews is the most peaceful city centre accommodation I've ever stayed in. It's quiet, central and full of character. When I wasn't out enjoying the great local shopping and restaurants I was in, enjoying the beautiful roll top bath, the cosy wood burning stove and just the overall comfort of this wonderful house! The place was spotless and Arron, the House Manager was extremely friendly and helpful. Thank you for the great stay. We'll be back soon I hope!! Thank you so much for taking the time to let us know how you enjoyed your stay at Merrion Mews, right in the heart of Dublin city. Delighted to hear that you had time to explore the city and then relax in the comfort and quiet of Merrion Mews. We do hope to welcome you back again soon. This is a very special building in the heart of Dublin. A magical experience, which will stay with all of us forever. Thank you for letting Irish Landmark know that you had a wonderful and memorable stay at Merrion Mews. we do hope to perhaps welcome you back again in the future to this property, or even another of Irish Landmark Trust's other properties. 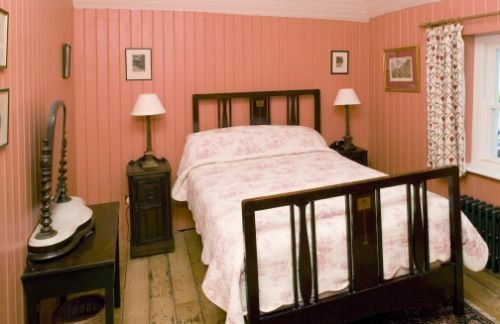 If you are even slightly allergic to the sterile environment of a hotel room then booking with the Irish Landmark Trust is without doubt the best option. As a non profit organization it is always good to know that fees paid go toward the upkeep of each property and contribute to future restoration projects. While staying at the Mews, my husband and two young daughters visited the National Art Gallery, Natural History Museum and Merrion Square Park that are all located nearby. There is also an option to take a horse drawn carriage around the area to see the sights in style. There is no shortage of fine restaurants and convenient places to eat near the Merrion Mews or you could also make good use of the well equipped kitchen and put together a meal fit for a King. The Garda horses do at times visit the stables below the accomodation but we were sorry not to see them on this occasion - giving us the perfect excuse to return again as soon as possible! Merrion Mews House Manager Aaron was extremely helpful. Along with the efficient and professional office staff, the experience from start to finish was planned flawlessly. Thank you Irish Landmark Trust for saving this building and making it available for us to enjoy. Wow, what a great review!! We're always delighted when we hear of our guests enjoying the property and even more so when you really appreciate what we do to save, share and sustain Ireland's built heritage. Merrion Mews really is a stunning property in a wonderful, central and peaceful location. Thank you so much for all the feedback and helpful information for other possible guests. We do hope to welcome you to any of our unique properties again soon. Merrion Mews was everything I expected it to be myself and two friends enjoyed a weekend here The property was beautiful warm spotless and very welcoming Thanks to Aaron and Leah. As my friend described it an oasis of calm. Located within a few minutes walk from all the city had to offer. We will be back. Thank you for taking the time to let Irish Landmark know you and your friends had a lovely stay at Merrion Mews. It really is such a lovely calm and quiet location for guests to relax after a busy day in the city centre. Delighted to hear that you are planning a return trip. Please do remember as a returning guest you will receive a discount so please do remember to contact the Bookings Office directly when making another booking at Irish Landmark Trust. A family wedding in Dublin. The perfect location. The perfect setting. Car park spaces x 2 which is a huge bonus. Secure and safe. A charming building packed full of character! Thank you for the wonderful review. It's great to hear you had such and enjoyable stay and that Merrion Mews was such a perfect place for you to enjoy your family wedding. You're right, having space to park your car in a Dublin city property is a huge bonus! We hope you can come stay with us again soon. We stayed 6 nights at Merrion Mews as part of a special family trip to celebrate my father's 80th birthday. There were 2 couples and 1 single person, so the number of bedrooms was perfect for us. We enjoyed walking to the local Tesco market every day to pick up breakfast and dinner items which we happily prepared in the spacious kitchen. There were plenty of nice dishes and cookware to meet our needs. We thoroughly enjoyed sitting by the fire each evening reading and playing cards after a wonderful day exploring Dublin. Our only complaint is the one bed in the room with the skylight - the mattress needed more support and tilted downward. Other than that, we were comfortable and pleased with the accommodations. Aron the housekeeper was extremely helpful and responsive. Thank you for letting us know about your stay at Merrion Mews. Irish Landmark are delighted to hear that you had such a lovely stay in Ireland's capital city and found the location perfect for exploring. It is wonderful to hear that you were well looked after by our wonderful Local House Manager during your stay. We will certainly look into the mattress you have mentioned. Merrion Mews really is a beautiful property in a great location! So central yet so peaceful. We're delighted you had such an enjoyable stay and thank you for the wonderful review. Merrion Mews every bit as good if not better than the Merrion Hotel. We rent a Landmark Trust House every year for our Christmas Family Get together. This one has been the best so far. Its location right behind the merrion hotel is 5 minutes walk from The National Gallery, Trinity College, not to mention some of Dublin's oldest and best pubs and restaurants so no expensive taxi's home at night. It has everything you could possibly need for a unique city experience and it's beautiful vintage decor without a TV is like stepping back in time. The log Burning stove in the l sitting room was so welcome at the end of the day. It was so lovely to have you back with Irish Landmark Triona and for you to have the chance to try out Merrion Mews this time. I am delighted to hear that the property lived up to your previous Christmas stays with us. The location of Merrion Mews really is wonderful isn't it, and for a property that is right in the center of Dublin it is such a peaceful place with no noise. Thank you for recommending Irish Landmark Triona and looking forward to welcoming you again. This was our third time staying in Merrion Mews. Excellent customer service - house manager Arron is always most obliging. The appartment is cosy, well heated, all modern appliances, and it is very central. Great restaurants, pubs, shops within easy walking distance. The parking space in th courtyard is also an advantage. We strongly recommend this place! Lovely to have you back to stay at Merrion Mews Emer. Delighted you had a lovely return visit to the wonderful centrally located Merrion Mews. Thank you for your great recommendation to other guests. We had a wonderfull stay in dublin also thanx to the nice appartment. The housemanager was kind and helpfull andere the place was clean and spacious. Restaurants and shop nearby. We only missed the horses. It's great to hear you had such an enjoyable stay. Merrion Mews is such a great location! It's a pity you didn't get to see the horses but maybe you could come again in the hopes of seeing them. You'd be very welcome. Thank you for the great review and I hope you enjoyed your trip to Dublin. This property is just beautiful! 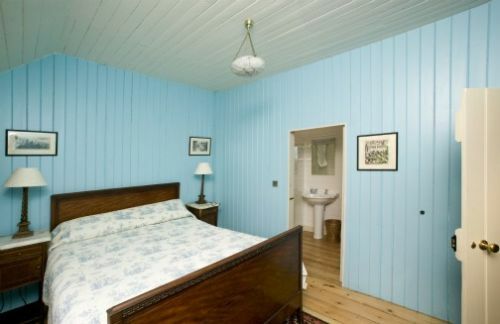 Every room was decorated so tastefully with all the modern home comforts that were needed. Myself and family got ready here for my wedding and it was perfect, our photographer was in his element with the beautiful surroundings. I have to say a special thanks to Irene who managed the booking and had to manage a last minute change and could not have been more helpful. This was the perfect venue for a wonderful weekend for our families. I would highly recommend this property for anyone coming to stay in Dublin. Delighted to hear you had such a special wedding weekend in Merrion Mews! It really is a beautiful house and I imagine the photos will be stunning. I'll be sure to pass on your thanks to Irene and you're very welcome to book with us again in the near future, maybe for your anniversary! Thank you for such a lovely review and congratulations to the happy newlyweds. We stayed for 3 nights surrounding a family wedding in the city. The house was lovely and cosy with so many amenities on the doorstep. The house is well equipped and the house manager couldn't have been more helpful. We really enjoyed our stay. Thank you for the great review! We hope you had a wonderful time at the wedding and we're so glad you enjoyed the beautiful location and that you felt so cosy in the house. You're very welcome to come stay in any of our unique properties in the future. Had a good time. The place is beautiful, the location is central. I would've preferred two showers - we all ended up sharing the one shower instead of using the bath tub, but I can see how that would be appealing for others. Thank you for letting us know you had a nice stay in Merrion Mews. There are no plans to replace the cast iron bath tub at this property as it is a special feature we feel and adds to the experience for guests. This was a charming place to stay while we visited Dublin at the tail end of a 10 day trip around Ireland. Receiving access was smooth, everything was immaculate, beds were comfortable. This was among the best places we stayed during our trip and I have already recommended it to friends traveling to Dublin soon. Will definitely look at other Irish Landmark Trust properties when I return to Ireland. Thank you for letting us know you had a lovely stay at Merrion Mews. Thank you for ending your trip with a stay at an Irish Landmark property. It lovely to hear that we have made an impression and that you will stay again with us in the future. Remember to contact us directly when you return as you will receive a discount as a repeat guest. Loved the Mews, my daughter got married from the Mews which made it an extra special stay. Brilliant location. An old world experience with modern conveniences. Thank you for supporting Irish Landmark Trust, a non-profit organisation, by staying at Merrion Mews. Glad to hear that you had a nice time. Was not sure what to expect but having read the reviews I knew that we were in for a treat. My goodness did we underestimate the treat though. Just an incredible stay was had by all - Grandad and kids included! Super central location (less then 5 minute walk to Merrion Square where we got to watch an outdoor movie with the kids as night began to fall on our first evening); super quiet (did not hear a thing, honestly); seriously warm welcome (House Manager was so friendly and got back to me straight away when needed to double check something quickly); parking (room for one car which we parked right over to the side as the Garda Mounted Unit use the stables below and need access at all times - didn't get to see them but it kept the kids and Granddad excited waiting to see if they turned up); great facilities (the kitchen was perfect for our Sunday roast family dinner and that cast iron bath before bedtime - just wow! ); bedrooms so comfy (I know everyone has different tastes in beds and pillows but for us they were perfect); really exceptional value for a city center stay (we split the cost between the 4 adults and it worked out really good value considering the location and facilities!). We will certainly come back and have already recommended it to friends who travel to Dublin for business as it just the perfect home away from home. We are already looking for another excuse to book as it would be the perfect location for Christmas shopping, visiting galleries, popping up to the city to catch up with friends, etc. Loved every single minute of it. Thank you for all your kind words. We are all here at Irish Landmark delighted to hear you had such a wonderful time in Merrion Mews and that you have recommended us to friends and family. The location is great for families and people in Dublin on business that do not want to stay in a hotel but looking for a home from home. Hopefully we get a chance to welcome you back again before the Christmas holidays. Private, quiet, central, authentic, unique, good value for money ... when looking for accommodation that is located smack-bang in the centre of Dublin city, these are not typically adjectives one can apply to any one place. Merrion Mews is different and achieves all of these goals and much more. Highly recommended. Wonderful to hear that you would recommend Merrion Mews to other guests. The central location is wonderful (less then 5 minute walk to Merrion Square) but the peace and quiet of this property really does make the stay even more enjoyable for our guests. I am glad that you got to have a Landmark Experience and do hope that perhaps we can welcome you back again in the future sometime. Thank you for taking the time to let other guests know how you enjoyed your stay. Merrion Mews is an excellent place to stay for a holiday in Dublin. All major attractions are just a few minutes walk from the house and there are excellent restaurants and bars just around the corner. We have stayed there several times for various events and plan on staying there again soon. A home away from home. Love the place. Thank you for your feedback, we are delighted you enjoyed your stay, come back again soon. Merrion Mews did not disappoint for my second stay at this charming property. We had a lovely time and were very comfortable. Great to have you back at Merrion Mews. Perhaps we can tempt you to another Irish Landmark property in the future or get the chance to welcome you back to Merrion Mews again. Very happy to see that you have a lovely stay. We really enjoyed staying at this incredibly central, unique apartment. It was in excellent condition, very clean, well equipped and very well hosted. And so quiet! The master bed was a bit saggy but that's a minor complaint. A wonderful place to stay and gave us such an easy time in Dublin, walking our three small kids to all the sights without driving or long journeys. They also loved the stables. 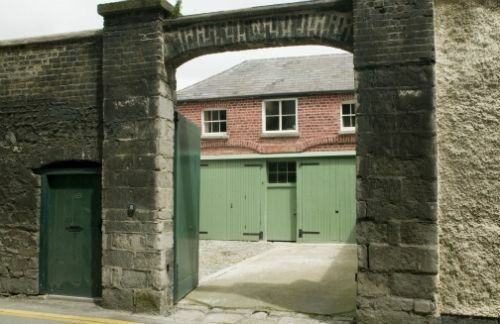 Wonderful to read that you enjoyed the central location of Merrion Mews to Dublin City. The peace and quiet at this property is always wonderful considering how central it is. We do hope that perhaps some horses stopped by during your visit? Hopefully we get a chance to welcome you back to another Irish Landmark property in the future. A group of six of us stayed at the Mews for 3 days over a weekend. The location is fabulous and walking distance to everything. 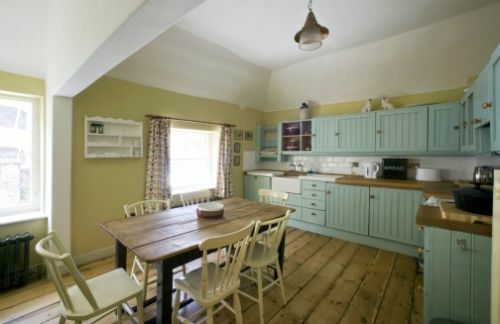 It is such a characterful property and we spent most of our time when not sightseeing in the kitchen which is well equipped, cosy, comfortable and full of light. Everyone in our group loved staying at the Mews and we all said we'd return. Thank you for your feedback, we are so delighted you enjoyed your stay, it'a always nice to hear what our guests think, come back again soon. What a quaint, lovely island of history and calm in the middle of Dublin. We loved staying at the Mews for the location and as a way to support the Trust - but didn't know how much we would love it! Plenty of room for our family of five and very nice to have a kitchen to make breakfasts before exploring the city. What you cannot see on the website for the Mews is the charm and cozy feeling of the place. Although we didn't see any horses, we still loved the Mews! This was a terrific location for our family to explore Dublin-just a little outside of the hustle and bustle- but very easy to find your way around the city. The house was oh so comfy and Aaron was terrific- easy to contact and very accommodating. Very highly recommend as a way to see the city but have a kitchen to have a family meal-the mews also had a lovely garden and the stable area was a cute historic view as well. Thank you for your feedback,it's always nice to hear what our guests think, come back again soon. We loved our stay at Merrion Mews. The location is ideal - within walking distance of city centre and bus stops were right around the corner. The house manager was very nice and helpful. The house itself was comfortable and cozy. We appreciated having a shower as well as a tub. Thank you for taking the time to write this review, we are really delighted you enjoyed your stay, it's always nice to hear what our guests think, come back again soon. A very real weekend alternative to overpriced and sometimes dull Dublin hotels. Our party of four - a couple and two singles - had come to Dublin for a Stanford music festival weekend. Charles Villiers Stanford a celebrated classical Irish composer was born in Herbert Street and his local church was St Stephen's, the Pepper Pot church just a stone's throw away. All within easy walking distance as well of our church and concert venues at Trinity College and the two Dublin cathedrals of St Patrick and Christ Church. Merrion Mews was much enjoyed by other of our fellow visitors to the Stanford festival weekend who dropped in to sample this unique location - including a number of Dubliners who were unaware of these Irish Landmark Trust's wonderful properties. Thank you so much for this lovely review, we are really delighted you enjoyed your stay, it's always nice to hear what our guests think, come back again soon. Stepped back in time staying here - but a very convenient yet secluded location with the amenities you need. Glad you enjoyed your stay, thank you for this review, come back again soon. I stayed I this nice place with your of my daughters (21-8yrs) discovering the city. A very nice ambiance. Sure to stay there next time again. We were 2 couples who stayed 3 days. The location and price cannot be beaten for Dublin in the summer. It's very pleasant to have a separate kitchen and sitting room. It was a little odd that the kitchen contained every imaginable cooking and dining implement, yet the baths lacked facecloths, bath soap, shampoo, or a hair dryer. Once we went shopping and bought the missing bath items, we had a pleasant stay. Some attention to maintenance (sticking doors, dusty curtains) is needed. If the tub were fitted with a hand held shower, it would be much more usable by guests. Merrion Mews is a wonderful properrty! Charming and historical, on a quiet street, but with modern conveniences tucked away. Also this is a great walking location for the museums and galleries. We - a group of six people - stayed a long weekend in Merrion Mews and we found the place very cosy, comfortable, unique and well-equipped with all the facilities one needs. The house manager was very helpful and friendly before the trip and on arrival. The are is peaceful, but you find lots of pubs and restaurant and a grocery just around the corner. Grafton st. for shop-a-holics is close, se is Temple bar with its vibrant night-life. I would come back to Merrion mews anytime! Thank you for taking the time to write this review and for the great feedback, delighted you enjoyed your stay, come back again soon. We did a girls long weekend in Dublin and ran across the Irish Landmark Trust. This property was phenomenal. Arron--the property manager--was very helpful and accommodating. He met us when we arrived, let us in early, and checked in via email during our stay to make sure we did not need anything. This property's pictures do not do it justice. It is 3 bedrooms, 1 is en suite, a nice family room, and a nice kitchen. There are two bathrooms (including the en suite). The hall bath currently just has a tub, but it looks like they are in the process of putting in a shower. The en suite has a FABULOUS shower--and I am a picky American who must have a hot shower with good water pressure on a daily basis. There was plenty of hot water for 5 people to take hot showers and the water pressure was amazing. Great location. We walked all over Dublin. You are a block from Merrion Square, where we spent a fabulous sunday morning shopping for art at the weekly art fair. There is a great local just down the block. You are a block from a Baggot (sp) street, with a Tescos, and lots of great restaurants. We had the best meal in the world at the Brookwood, which is around the corner. The beds were comfortable and the rooms large. We will definitely be staying there any time we go to Dublin. Thank you for this wonderful review, really delighted you enjoyed your stay, it's always great to hear what our guests think, would love to see you back perhaps at another one of out properties. Great historic home- wonderful amenities, clean, and quiet location. Our host was lovely and we had wonderful communication between us. We would definitely stay again! Thank you for taking the time to write this reviews, really delighted you enjoyed your stay, it's always a pleasure to let guests enjoy our properties, come back again soon. Merrion Mews is a magical place! The photos only begin to capture the wonderful warmth and all around good vibes of this lovely listing. The location is perfect- in the center of everything but also (somehow!) quiet and secluded. Our hosts were easy-going and accommodating. This place is home-away-from-home and I highly recommend staying here on your next trip to Dublin. The accommodation is very dated probably to continue the theme of the property. However, the lounge we found very depressing with old furniture and did not use at all, I think some attention is needed here. Bedrooms are adequate but some maintenance is needed on taps, toilet seats and doors not closing properly, also the thermostat would not turn down and we were very hot at times, we did report all these things when we left, so hopefully some improvements will be made. The bowls in the kitchen are not suitable at all for cereal and some cereal bowls are needed as the ones in the kitchen are more like plates and also so cushions on the kitchen chairs would be nice. Thank you for taking some time to let us know how your recent stay at Merrion Mews went for you. I have discussed your notes with the Local House Manager regarding sanding of doors, toilet seats, etc and I am happy to report that these have looked into and fixed. The other details you have raised have been forwarded on and hopefully we will be able to look at those for future guests. We were completely underwhelmed by Dublin but this flat was a perfect refuge from a rather grim city. The flat has been restored well, although several doors stuck on the warped floorboards and need attention and the hot water tank needs to be larger with 6 people staying, or the thermostat should be set hotter. Otherwise, it was a really nice place to stay, and although the beds were rather small for doubles and the pillows rather bouncy, it was quiet and, most importantly, ideally located. Merrion Mews is, in fact, in quite the nicest part of Dublin. Go south of it and see the pretty Georgian area. Go north and you get into the rather ugly and unkempt city centre. Dublin has been ruined by very ugly 50s-70s buildings located in the most incongruous places and there is very little to do in the city except eat and drink. Eating and drinking can be done to excess at a fairly reasonable price and much fun can be had in the bars, pubs and restaurants, but don't plan on much else. Our husbands had a wonderful time playing golf at Portmarnock and St Anne's whilst we wandered around a city that seemed downtrodden and had little to offer in the way of culture - even the famous National Gallery was mostly shut for renovations that have been ongoing for no less than 6 years! This is a city for hen/stag nights and little else. The Merrion Mews flat was quite the best thing about the whole weekend and we did enjoy our stay there. Thank you for taking the time to review your recent stay at Merrion Mews. Indeed, everyone has different experiances of the city itself but I can see in your review that your enjoyed your stay in Merrion Mews and that you found it's location within the city of Dublin to be a highlight. Location is fabulous, and the character that we sought was plentiful. There were some things that could have been improved: the beds are not great, the lightbulbs are VERY dim, and the pillows very flat. But the kitchen is very well-stocked, the garden a delight (although it needs a LOT of weeding! ), and the apartment is spacious and welcoming. Thank you for taking the time to let us know how you got on during your recent stay at an Irish Landmark Trust property. We are delighted to hear that you enjoyed your stay at Merrion Mews. Your point have been forwarded on to the House Manager. Thank you for your feedback. Thank you taking the time to write this review, really delighted you enjoyed your stay, would love to see you back in the near future. We thoroughly enjoyed our stay at Merrion Mews. The cottage is cosy and charming and in the perfect location for discovering the city. We immediately felt at home and would highly recommend to friends and family. Arron was the ideal host, we were made to feel very welcome and then left to our own devices but could call him if we had a problem, which we didn't need to. The decor of the cottage was inviting, the whole place was spotlessly clean and we didn't need to get taxis to reach the city centre as it is only a short walk. It's ideal for families or groups of friends. Thank you for taking the time to write this review, so glad you enjoyed your stay, would love to see you back perhaps at another one of our properties. Enjoyed our week stay in this quirky, quiet apartment; so close to everything and in a great part of Dublin - a local pub a few minutes walk away. A really great experience staying in a landmark property - something a bit different! Really enjoyed having a fireplace (central heating also) and felt very cosy and at home here. Thank you for taking the time to write this review, so glad you had a nice stay at Merrion Mews, would love to see you back perhaps at another one of our properties. We were delighted with the tastefully furnished apartment. We enjoyed the fireplace to brighten up the wet November days. Although we arrived slightly later than foreseen there was no problem with the keys and the apartment was well heated. Arron was very helpful and easy to contact when we had questions to ask. The situation is ideal - almost everything is within walking distance from the mews. We would definitely recommend the place and hope to come back again in the future. Suggestions: there is no teapot - it would be a nice addition. Also some washing-up liquid or equivalent would have been helpful for cleaning the sink on our departure. We had a great stay in this lovely period property within easy walking distance of Grafton Street. Very comfortable beds and enough space and a wood burner with fuel to use which was appreciated. However given there was six of us in the property it would have helped if there was a shower in the main bathroom as the only shower was in the en suite. Also I would expect there would have been a cafetiere in the kitchen for quests to use. Thank you for taking the time to write this review, so glad you enjoyed your stay, it's always nice to hear what our guests think of their stay. There is a bath in the main bathroom and unfortunately it is not possible to put a shower in this room aswell due to the constraints of space and also the fabric of the conservation work carried out. I will certainly check into the coffee pot with the Local House Manager as this should be available to our guests and perhaps it was just put away somewhere. Thank you for bringing it to our attention. For a week in August 2015 Merrion Mews became our second home, and it was like a home, not a place we were renting for a few days. From the moment we walked up the narrow stairs and through the door at the top we felt at home. When leaving at the end of the week we had 3 teenagers who were very reluctant to leave. Therefore we are back again next year. So glad you and the family enjoyed your stay, thank you for the feedback, look forward to your return. I would recommend Merrion Mewes to anyone. It's in the best location, nice and quiet, but in the centre of town. Lovely historic building with loads of character. Delighted you enjoyed your stay, thank you for the lovely feedback. Merrion mews is wonderfully located and even though five adults in the property it did not feel cramped, it's a cozy property and would stay again and recommend it to others. Thank you for taking the time to write this review, so glad you enjoyed your stay, would love to see you back in the near future. Great stay at the Merrion Mews with the family. Property is beautifully maintained, centrally located and a very comfortable base for a few days in Dublin. So glad you enjoyed your stay , thank you for this review, it's always nice to hear good comments, come back again soon. interesting property in excellent location. We were very well lookd after. Warm welcome from Arron when we arrived with good intel on local eating and drinking spots. Location was excellent for us, close to museums, galleries etc as well as the restaurants and pubs. We found the building, and its history, very interesting - although we didn't get to see the horses!! To summarise, we loved Dublin and couldn't think of a better base to explore it from. Thank you for the feedback from your stay at Merrion Mews, so glad you enjoyed your time there , we hope you come and stay with us again soon. This simple and homey carriage house located a short walk from the center of Dublin was a delight to call home during our family vacation and we would return in a heartbeat! My two daughters and I stayed at this gorgeous, comfortable, one-of-a-kind place - located in the center of busy Dublin, yet tucked away on a quiet street. When we entered we thought we just travelled back in time - this place is so charming! It was also clean and had everything one could wish for - in addition to uncomplicated booking and arrival experience! Thank you for taking the time to write this review and for the positive feedback , really delighted you enjoyed your stay. Really lovely place to stay, full of character. And a great location - an easy walk to all the main Dublin sights. Arron was very accommodating when we arrived. Thank you for your feedback , so glad you enjoyed your stay at Merrion Mews, would love to see you back in the near future. Lovely, comfortable and handy accommodation! We were a party of four ,three adults and a teenager (with mobility issues and on Autistic spectrum) . Felt very safe and secure at Merrion Mews although was tight going to park the car (Toyota Verso). The stairs were a challenge for my daughter but by second day she was more confident. The kitchen was so spacious, as were all the rooms, clean and well equipped .Home from home! We had a great night at the Gaiety (walking distance) we went to see Riverdance. The next day we spent at Zoo. Tesco just around the corner closes at 7pm on a sunday. We loved it and wished we had booked for longer . Thank you for talking the time to write this review and for the positive feedback , really delighted you and the family enjoyed your stay and got to see Riverdance :) would love you to come back and stay in the near future. Merrion Mews bringt the old and the new perfectly together. It is very clean, spacious and well furnished. The location is perfect with two parks, many restaurants and shops in walking distance. Very quiet at night. We loved this rental, so central yet tucked away and VERY quiet on a one way mews. Walked everywhere we wanted to go. Charming and lovely renovations, well equipped. They do tell you stairs up are very narrow and it is true but was no issue at all for us with our 3 kids. Only inconvenience is the wireless is slow/sporadic and it could get frustrating and impossible for multiple users. I would gladly pay a bit more to have good wireless and would bet most international travelers feel the same. Even when I was only user early in morning, it was very slow. Staff great meeting us and answering questions during our stay. Will definitely rent again when we return to Ireland. We were sorry to leave! Thank you for taking the time to write this review, really delighted you and the kids enjoyed your stay, thank you for letting us know about the wireless , look forward to your return to Ireland. This is a superb place to stay in a fantastic location. The welcome was great and the property has everything including great privacy and quietness at nighttime. The one and only word of warning I'd have is that there is only one shower which is located in the en suite of one of the bedrooms, the main bathroom has a great bath but no shower. Delighted you enjoyed your stay, thank you for the feedback , would love to see you back in the future. It was pleasant to stay at Merrion Mews. The town house is well designed, lovely, clean and located in a calm area not far away from the city centre. You should definitely go to Dublin and stay here! Thank you for your feedback, delighted you enjoyed your time spent in Dublin and so glad you liked the property. We had a great time at Merrion Mews - a property full of character and in a great location. Very close to the centre but far enough that it was quiet and peaceful, especially at night. The downsides were that the wifi was too weak for proper use and there is only one shower in the en suite bathroom but there is a bathtub in the main bathroom and all in all, we didn't see this as much of a problem. Thank you for your feedback, really delighted you enjoyed your stay, it's always nice to hear positive comments, hope to see you back in the future. Once found it was all we could ask for. Very easy to feel you lived there for years. Lots of everyday needs on your doorstep. Charming and homely. Def recommend a stay. Delighted you liked the property and enjoyed your stay, thank you for your feedback , it's always nice to hear positive comments. A great Dublin location....and oh so QUIET! We stayed here for 3 nights from St Patrick's day and loved the place. It's very central and has a very well equipped kitchen and a wonderful deep cast iron soaking tub. It is quiet and cosy and we slept like logs apart from the folks in the canopy bed. Our only small criticism would be that the canopy bed really needed a new mattress, as the existing one had come to the end of it's life The other two beds were totally fine. Arron who met us was very helpful, and responded to a small query we had very quickly. The place is a gem in Dublin and the free parking space was the cherry on top of the cake. Thank you for taking the time to review your stay, delighted you enjoyed yourself, come back again soon. We really enjoyed our stay. Those who stay need to be able to enjoy the historic property and overlook the quirky doors and locks, etc. The location is great and the property manager is very responsive. We loved it and will return if we are lucky enough to be in Dublin with a large group in the future. Thank you for your feedback, so glad you enjoy your stay, would love to see you back in the future perhaps at another one of our properties. Merrion Mews is a charming and cozy home. It's location truly could not be better. It is VERY close to so many of the typical Dublin attractions; we could walk to almost all with ease. Despite this, it was nice and quiet inside the home. The kitchen was a decent size. The beds were very comfy. The sitting room was welcoming. Truly only one complaint about the house: it has two bathrooms but only one shower....and the one "shower" did not actually shower us with water. It was more like a trickle and a spit. Washing anything more than the bare necessities was an impossibility. Though we tried to fix this issue, the water pressure never improved. This would be a deal breaker for a future stay....but if addressed, I'd go back again and again. Thank you for taking the time to comment on your recent stay at Merrion Mews. We are delighted to hear that you enjoyed you Holiday Home. The location is a big bonus as altough you are so close to the city center there is no disruption to the peacefulness of Merrion Mews. I have passed on your note about the shower to the Property Manager. We rented a car, and it was so nice having our very own private space for it. Aaron was the greatest asset to our stay, left us milk coffee and tea for our morning which was nice after a long trip. Thanks! Anyone with a family need not look anywhere else. It was so nice to keep us all together. Thank you for this lovely review, delighted you enjoyed your stay. The Merrion Mews was absolutely ideal for my family. My wedding was at the Merrion hotel and the Mews was the perfect base for everyone. It was roomy and clean and quiet. THANK YOU. Thank you for the great feedback ,delighted you enjoyed your special day, it's always a pleasure to let guests enjoy our properties. Period comfort and convenience at the heart of the city. Do you want to stay in an old building with fascinating features but modern comfort? If so this property is for you. An added attraction is that you can leave your car in a safe park and walk anywhere in Dublin. Thank you for the comments,it's always great to hear such positive feedback. The setting is ideal for walking about the city, particularly the south side. Close to great pubs. O'Donoghues around the corner. If you'd prefer to check out the Dail, it's even closer! Several grocery shops within 5 mins walk. An irresistible bakery, maybe 3 mins away. The apartment is very spacious and suitable for a large group on a long stay. It would be challenging for the very elderly or disabled. Despite the information on the website there is a clothes washing machine and a rather uneven internet access. Thank you for the lovely review,delighted you enjoyed your stay,it's always a pleasure to let guests enjoy our properties. Very homey and very central. I stayed in this property with my family for the two nights before my wedding in Dublin city centre. It was a wonderful alternative to a traditional hotel because it kept us altogether and recreated the family home atmosphere. The property is superbly located and has the advantage of a carpark space (it can be really expensive to park your car in Dublin's city centre). I would totally recommend this place. We enjoyed the fantastic atmosphere and furniture of this apartment. It was extremely enjoyable to return to this restful haven in the city, so close to the national gallery and other places. Had a wonderful 5 night stay at Merrion Mews, right in the heart of Dublin. The Irish Landmark Trust were extremely easy to deal with and most helpful. The property is full of character and charm and has very good facilities for a family holiday. Six of us stayed in the property including two young grandchildren. Although one of the party walks with the aid of a stick, accessing the staircase from the ground level courtyard to the first floor entrance, which has 3 winding steps on the dogleg of the stair, was still possible, although tricky. It was good to have no TV for the length of the stay! The property could not be more centrally located and is within easy reach of all of Dublin's many attractions and fabulous transport system. There are several good restaurants within easy reach - particularly well worth visiting is The Unicorn which is within about 300 metres. Shops for food and other general requirements are on the doorstep. One of the great benefits of the property is that there is no-one nearby to disturb you or you to disturb them! There are some minor quirks to the property, as there will be with most authentic historic building restorations, but these do not detract from the enjoyment of the stay. I would thoroughly recommend a short or long stay here. Hunter Reid OBE, from Glasgow. A fantastically located and interesting property. We had a great week in Dublin and enjoyed staying in Merrion Mews. Our stay could have been made more comfortable if 2 of the beds had been bigger. They are too small for two people sharing. We would also have appreciated a change of towels in the middle of the week. The kitchen was well equiped with utensils and crockery. We had a fab time, ideally positioned for Dublin visit. A few minor comments: Kitchen T towels, light bulb in the kitchen, bed a bit wobbly in the blue room - didn't detract from the holiday just trying to be helpful. Thank you for all your comments,delighted you had a fab time,come back again soon. 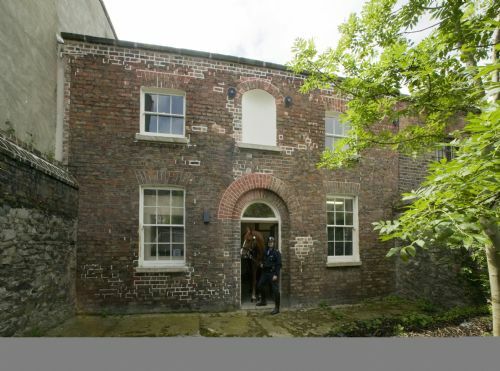 Merrion Mews is a Gem of a place, situated within easy access of many of Dublins sights. It is full of rustic charm and quite comfortable. While it isn't a 5 star kind of place, the little imperfections are hardly noticeable because of its period charm and homey comfort. The hosts are fantastic. The Merrion Mews provided the perfect, QUIET venue to relax after long days of sightseeing. It was easy to walk to all the major attractions, and there was a convenient bus stop on the hop-on-hop-off tour route. The rooms were all comfortable, the sitting room cozy, and the kitchen was a wonderful place for our travel companions to plan out our day over tea. I would stay here again in a heart beat! Thank you for the great feedback from your stay, we hope to see you again for a visit in the near future. We stayed 2 nights at Merrian Mews and we really enjoyed it. Our host was very nice and made check-in extremely easy. We had the whole place to ourselves which was great. Bedrooms were clean, large, and comfortable. Note that the green colored room has a fairly short bed, so if you're tall you should probably pick a different bedroom. The location was a pleasant surprise - it's in the middle of everything! It worked out great for us as it was our first time to Dublin. It's a short walk to several pubs, St. Stephen's Green, Trinity College, and the main downtown area. The only minor downside was that we didn't find the washing machine until the day we left (it was hidden in the kitchen). We also wish we'd spent more time at the house as it was super cozy, comfortable, and it had a lovely courtyard. We highly recommend staying at Merrian Mews. Thank you for the great feedback, perhaps you will return to Merrion Mews in the future. A lovely four night break in the centre of Dublin near some of the city's best restaurants. Private parking was a real bonus. All was perfect - kitchen well equipped and wifi worked (you don't get wifi in British landmarks!). My only criticism was that a new loo seat would be nice in one of the bathrooms! Thank you for this feedback,delighted you enjoyed your stay. We were 5 friends coming from Paris and the place was perfect. The house is nice, comfortable and warm. You only have to walk like ten minutes to go anywhere. Everything was perfect for us. We went to Dublin to spend the week end and St Patricks´s day and it was wonderful. The house was really nice and confortable. Thank you for the lovely photo and feedback,hope to see you back soon . We had a wonderful family weekend at Merrion Mews. Loved it all - rooms, kitchen, sitting room and bathrooms all charming and had everything one wanted. Visiting at end of January it was warm and the fire was wonderful. Only negative comment was hot water was a bit limited. I think the staff member explained re shower but we couldn't get it to go! Great location,lovely bit of history.Needs a bit of regular maintainance and care from the Trust.Bit neglected. Would not let that put me off staying there again. This has got to be one of the most charming places to stay in Dublin. A feel of the country, nothing "Boutique" about it, just plain,honest and tidy, in the centre of and yet away from the noise of a capital city that is Dublin. Well done the Landmark Trust. thanks for the lovely feedback, would love to see you again perhaps at another one of are properties. I have spoken to the very, very nice ILT office staff. The mews needs a good clean, bulbs,taps,loo,heating and all the basics sorting. The glitches stop it being good value for money. It had a hint of being in a state of ' it is charming so anything will do' . This is easily sorted and then it will be perfect. We have told people about it due to its position in Central Dublin but we did warn them that things do not always work! It is no longer acceptable to for a place as valued as the mews to rely on charm and position. There should also be pride in its presentation. It was the best experience I could possibly imagine. The house was beautiful, cosy, well conditioned, warm and close to everything. We will definitely return!! Thanks!!! Thank you for your wonderful feedback and the photo :) Hope you return soon.